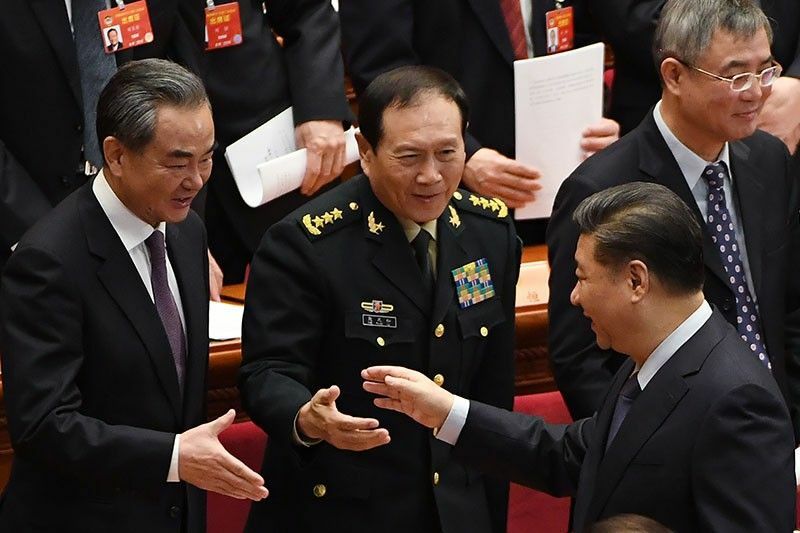 China's President Xi Jinping (R) shakes hands with Foreign Minister Wang Yi (L) and Defence Minister Wei Fenghe as they leave after the closing session of the Chinese People's Political Consultative Conference at the Great Hall of the People in Beijing on March 13, 2019. MANILA, Philippines — Opening an investigation into allegations of committing crimes against humanity against Chinese President Xi Jinping is now up to the International Criminal Court. Two days before the effectivity of the Philippines' withdrawal of its ratification of the Rome Statute of the ICC came into effect, former Foreign Affairs Secretary Albert del Rosario and former Ombudsman Conchita Carpio Morales submitted a communication against the Chinese head of state. The former Philippine officials urged ICC Chief Prosecutor Fatou Bensouda to conduct a preliminary examination into crimes allegedly committed by Chinese officials in the South China Sea, which is within Philippine territory. Aside from Xi, Chinese Foreign Minister Wang Yi and Chinese Ambassador to Manila Zhao Jianhua were named in the communication for "implementing China's systemic plan to control the South China Sea. The ICC is mandated to try individuals, not states, and hold them accountable for the most serious crimes in the international community such as genocide, war crimes, crimes against humanity and the crime of aggression. China, however, is not a state party to the Rome Statute. China not being a party to the statute serves as an obstacle to this case as there would be an issue of jurisdiction, international maritime law expert Jay Batongbacal said in an interview with ABS-CBN News Channel. "No case has been filed yet, as it appears that the communication is only asking the prosecutor to open an investigation," Batongbacal also said in a text message to Philstar.com. If the prosecutor would pursue filing a case against the concerned Chinese officials, assuming that an investigation will be opened, China would most likely reject it. "China, not being a signatory to the Rome Statute, most certainly will reject the case," Batongbacal said. Del Rosario and Morales argued that the ICC has jurisdiction over the "atrociously inhumane actions" of Chinese officials in the contested waterway as it occurred "within Philippine territory." Under Section 12 2(a) of the Rome Statute, the ICC may exercise jurisdiction if the "State on the territory of which the conduct in question occurred or, if the crime was committed on board a vessel or aircraft, the State of registration of that vessel of aircraft." Batongbacal, on the other hand, said in a television interview that China's massive-island building activities occurred while the arbitration between Manila and Beijing was ongoing. The United Nations-backed Permanent Court of Arbitration issued the ruling invalidating Beijing's nine-dash line claim over the South China Sea on July 12, 2016. Batongbacal also noted that environmental crimes, which Del Rosario and Morales indicated in the communication against Chinese officials, are far from the definition of crimes under the Rome Statute. Under Article 7 of the Rome Statute, crimes against humanity include attack against any civilian population such as murder, extermination, enslavement, deportation or forcible transfer of population, torture, sexual violence, persecution against any identifiable group, crime of apartheid and enforced disappearance of persons. The accusations against Xi would most likely fall under the crime of aggression, which includes invasion, military occupation and annexation by the use of force or blockade of the ports or coasts. As the Philippines was withdrawing membership from the ICC, Supreme Court Senior Associate Chief Justice Antonio Carpio reminded the government that a recent amendment to the Rome Statute on the crime of aggression would have helped the country in running after other states that would invade our islands. This amendment took effect in July last year with 36 states ratifying the amendments on the crime of aggression as of October in the same year. The Philippines was not among the 36 countries that ratified the amendment. The Office of the Prosecutor (OTP) is in charge of determining whether a submission meets the standards of the Rome Statute for a full-blown investigation. "For this purpose, the OTP conducts a preliminary examination of all communications and situations that come to its attention based on the statutory criteria and the information available," the ICC said in its official website. The ICC may initiate a preliminary examination on the basis of information sent by individuals or groups, states, intergovernmental or on-governmental organizations. In this case, it would be based on the communication submitted by Del Rosario and Morales. Whether the communication would prosper into an initiation of an investigation would depend on the prosecutor. Bensouda, on her own initiative, may initiate to open an investigation if her office receives information involving crimes committed in the territory of a state party. The Philippines was still a member of the ICC when the communication against Chinese officials were submitted. Under Article 53 of the Rome Statute, the prosecutor may "initiate an investigation unless he or she determines that there is no reasonable basis to proceed under this Statute."